PacketExpert™ 10GX Software Ver 9.1.31 | Download Now! 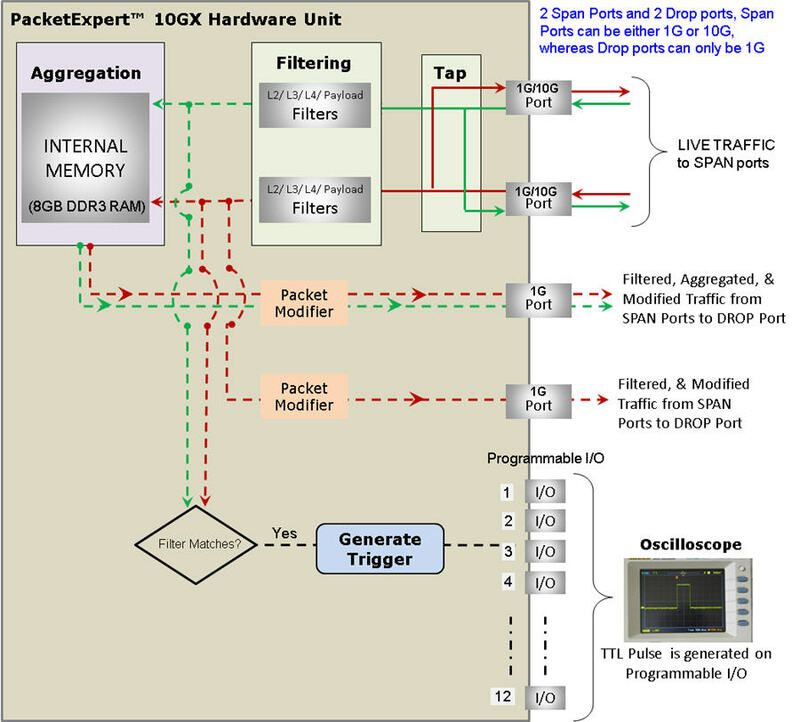 The PacketBroker is an optional application added to GL’s PacketExpert™ platforms, that allows the Ethernet test tool to be used as a highly precise non-intrusive Wirespeed Ethernet Tap with all the necessary features packaged within to capture real world traffic, define multiple filters for drilling-down to traffic of interest, generate triggers based on packet filters, and transmit filtered/aggregated/modified packets for deep-packet data analysis. PacketExpert™ 1G (PXE100) - This is a quad port USB based portable unit, of which 2 ports are of 10/100/1000Mbps Electrical or Optical (Port 2, Port 3), and other 2 are 10/100/1000Mbps Electrical only. The application captures on the 10/100/1000Mbps Electrical / Optical ports (Pass-through ports) and outputs the filtered and modified packets on output ports (Port1 and Port4) respectively or aggregates the output to either Port1 or Port4. All the features of high-end taps are packaged into this portable unit making it suitable for field testing and remote testing any point in the network. PacketExpert™ 10G (PXG100) - This is a quad port USB based portable unit, of which 2 are 10 Gbps optical ports, and other 2 are 10/100/1000Mbps Electrical / Optical ports. The application captures on 10 Gbps optical ports (Pass-through ports) and outputs the filtered and modified packets is either aggregated or individually output on 1 Gbps Electrical/Optical port. All the features of high-end taps are packaged into this portable unit making it suitable for field testing and remote testing any point in the network. PacketExpert™ 10GX (PXN100) - This is a quad port USB based portable unit, of which 2 are 10/1 Gbps optical ports, and other 2 are 10/100/1000Mbps Electrical / Optical ports. The 10/1 Gbps Optical ports can be down-shifted to support 1Gbps Electrical ports, thus offering 4 Electrical / 4 Optical 1 Gbps ports for ethernet testing. The application captures on 10 Gbps optical ports (Pass-through ports) and outputs the filtered and modified packets is either aggregated or individually output on 1 Gbps Electrical/Optical port. And when 1Gbps ports are configured to capture (pass-through ports), the filtered/aggregated/modified packets are output on 1Gbps ports only. Thus, operating in all 1Gbps ports mode. The portable unit is suitable for field testing; while the compact design of the unit allows to easily deploy multiple such units in the rack enclosure providing high-density form factor solution. The traffic on the output ports can be analyzed using packet analyzers such as PacketScan™-All IP analyzer or Wireshark®. PacketExpert™ also supports Command line Interface (CLI) to access all the functionalities remotely such as Bert, Loopback, RFC 2544, Record Playback, IPLinkSim™, ExpertSAM™, and PacketBroker using TCL clients and MAPS™ CLI Server/Client Architecture. Capture packets non-intrusively over RJ-45 (Electrical) and SFP (Optical) ports at nano-second precision. The filtered packets from both directions are aggregated and sent out on a single output port. The PacketExpert™ 10GX hardware unit is equipped with both Electrical/ Optical ports (1000 Mbps) and only Optical ports (10G). The 10G: Port 1 and Port 2 optical only ports can be configured in Pass-through mode, and the 1G: Port1 and Port2 is used in either SFP or Electrical mode to act as output ports. Similarly, the 1G: Port 1 and Port 2 can be used in either SFP or Electrical mode, which when configured in Pass-through mode, the 1G: Port3 and Port4 optical or Electrical ports act as output ports. Thus, all 4 ports on the unit is operating in 1Gbps. The Output ports on the unit in any of the above configurations can be connected to an external storage device or to an analyzer for detail traffic analysis. It is important to notice that although Pass-through ports and Output ports are both labelled with the port numbers, they are not interchangeable. Pass-through and Output ports have a fixed role and their purpose cannot be configured by users. In 10G mode, the Dual SFP 10 Gb/s ports (10G: Port#1, Port#2), are generally connected in Pass Through to tap the network under test. In 1G mode, the Dual RJ-45 ports (1G: Port#1, Port#2) for electrical connection 10/100/1000BASE-T. Dual SFP ports for optical connection 1000 Mbps are connected in Pass Through to capture the network traffic. In 10G mode, Dual SFP or RJ-45 (1G: Port#1, Port#2) based 1 Gb/s ports are used as Output Ports to forward capture packets to real-time packet analyzer. In 1G mode, Dual SFP based 10 Gb/s ports (1G: Port#3, Port#4) can be down-shifted to support 1Gbps (Electrical/Optical) ports, thus offering 4 Electrical / 4 Optical 1 Gbps ports for testing. The PacketBroker application, allows PacketExpert™ 10GX to capture packets at wirespeed (up to 10 Gbps) non-intrusively over Optical ports at nano-second precision. It supports Tapping (Pass through mode) and Filter-Aggregate-Modification of the captured packets. 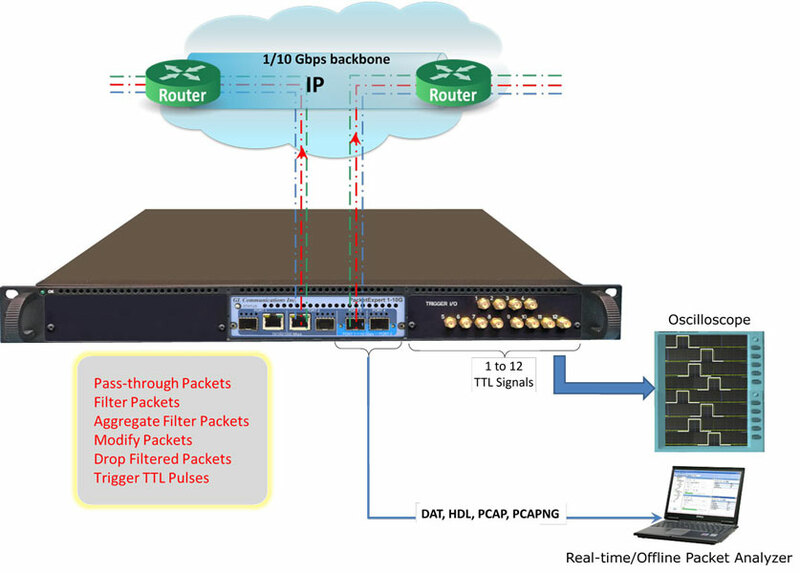 The 1G Electrical/Optical ports of the PacketExpert™ 10GX hardware can also be configured to non-intrusively capture network traffic at wirespeed. PacketExpert™ operation is bi-directional, which means that both transmission directions are simultaneously processed by the equipment. Tap: Traffic is forwarded between the Pass-through 10G/1G ports (Port 1 and Port 2) without any modification or delay. This makes the Ethernet link connected between Ports 1 and 2 (10G/1G ports) act as a transparent full duplex Ethernet link, so that the connected devices/networks will not notice that a device is connected between them. Filter: Supports wire-speed filtering of Layer2/Layer3/Layer4 Ethernet packets, with each port featuring up to 16 simultaneous filters each of 120 bytes in length. Mono Trigger and Continuous filter modes are also supported. Filter can be set to any offset within the packet, which gives flexibility to filter any header field as well as the payload. Aggregation & Output: The 10G/1G port 1 (Pass-through port) traffic filtered is normally sent out on 1G port1/1G port3 (Output port). Similarly, 10G/1G port2 traffic filtered is sent out on 1G port2/1G port4. Alternatively, the filtered traffic from both 10G/1G ports can be aggregated and sent out on a single 1G port as a single stream. Since the aggregated stream rate can exceed wirespeed rate of a single port, the aggregated traffic is buffered in the onboard 8 GB DDR3 RAM memory, before being sent out. The traffic on Pass-through ports is filtered and is sent to Packet Modifier, which is then sent out on Output port. 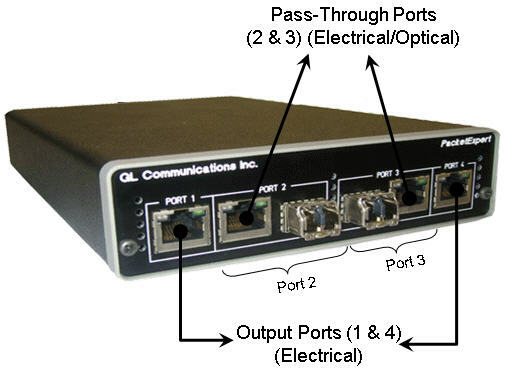 The Pass-through ports can be 10G/1G while the output ports can be only 1G ports. So, the traffic on Output ports are Filtered and Modified Traffic from pass-through ports. The PacketExpert™ 10G hardware unit is equipped with both Electrical/ Optical ports (1000 Mbps) and only Optical ports (10G). The 10G: Port 1 and Port 2 optical only ports can be configured in Pass-through mode, and the 1G: Port1 and Port2 is used in either SFP or Electrical mode to act as output ports. Similarly, the 1G: Port 1 and Port 2 can be used in either SFP or Electrical mode, which when configured in Pass-through mode, the 10G: Port1 and Port2 optical only ports act as output ports. The Output ports the PacketExpert™ 10G unit in any of the above configurations can be connected to an external storage device or an analyzer for detail traffic analysis. In 10G mode, the Dual SFP 10 Gb/s ports, are generally connected in Pass Through to tap the network under test. In 1G mode, the Dual RJ-45 ports for electrical connection 10/100/1000BASE-T. Dual SFP ports for optical connection 1000 Mbps are connected in Pass Through to capture the network traffic. In 10G mode, Dual SFP or RJ-45 based 1 Gb/s ports are used as Output Ports to forward capture packets to real-time packet analyzer. In 1G mode, Dual SFP based 10 Gb/s ports are used as Output Ports to forward capture packets to real-time packet analyzer. The PacketBroker application, allows PacketExpert™ 10G to capture packets at wirespeed (up to 10 Gbps) non-intrusively over Optical ports at nano-second precision. It supports both Tapping (Pass through mode), and Tap-Filter-Aggregate-Modification modes. The 1G Electrical/Optical ports of the PacketExpert™ 10G hardware can also be configured to non-intrusively capture network traffic at wirespeed. Tap: Traffic is forwarded between the Pass-through 10G ports (Port 1 and Port 2) without any modification or delay. This makes the Ethernet link connected between Ports 1 and 2 (10G ports) act as a transparent full duplex Ethernet link, so that the connected devices/networks will not notice that a device is connected between them. 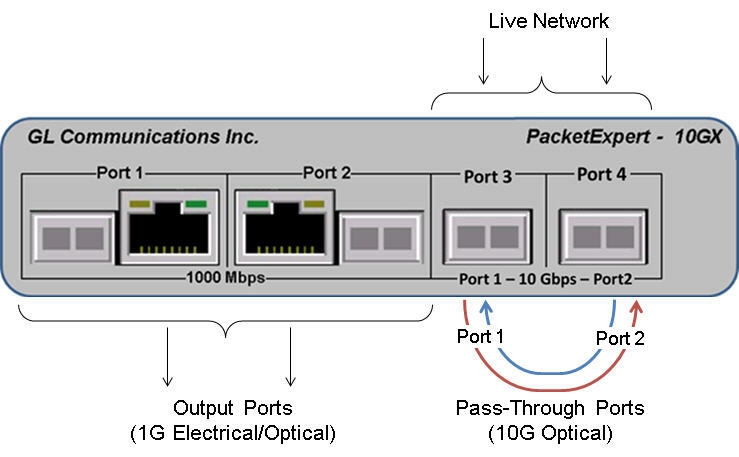 Aggregation & Output: The 10G port 1 (Pass-through port) traffic filtered is normally sent out on 1G port 1 (Output port). Similarly, 10G port2 traffic filtered is sent out on 1G port2. Alternatively, the filtered traffic from both 10G ports can be aggregated and sent out on a single port as a single stream. Since the aggregated stream rate can exceed wirespeed rate of a single port, the aggregated traffic is buffered in the onboard 8 GB DDR2 RAM memory, before being sent out. The traffic on 10G port 1 (Pass-through Port) is filtered and is sent to Packet Modifier, which is then sent out on 1G port 1 (Output port). Similarly, traffic captured on 10G port 2 (Pass-through Port) is filtered, modified and sent out on 1G port 2 (Output Port). So, the traffic on Output 1G ports 1 & 2 are Filtered and Modified Traffic from pass-through 10G ports 1 & 2 respectively. The PacketExpert™ hardware unit is equipped with both RJ-45 ports (Electrical) and SFP ports (Optical). The Port 2 and Port 3 can be used in either SFP or Electrical mode, and are generally called as Pass-through ports. The Ports 1 and Port 4 are RJ-45 ports, and are generally called as the Output ports. When these are used, connect the PacketExpert™ unit with an external storage device or an analyzer. 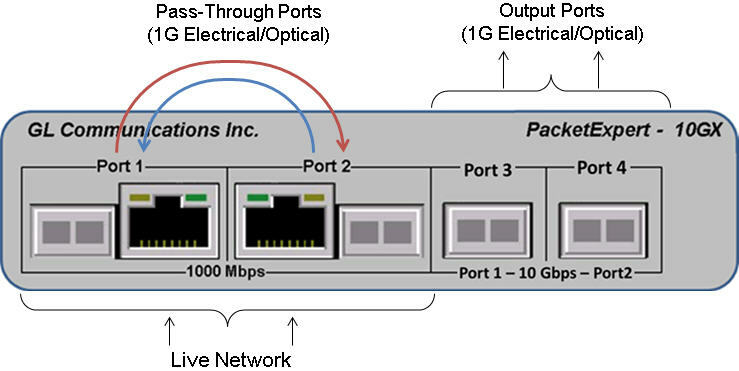 Pass Through Ports (2): Dual SFP or RJ-45 based 1 Gb/s ports. The Ports 2 and 3, are generally connected in Pass Through Mode to tap the network under test. Output Ports (2): Dual RJ-45 ports for electrical connection 10/100/1000BASE-T. The Output Ports interfaces are used to forward captured packets to real-time packet analyzer. 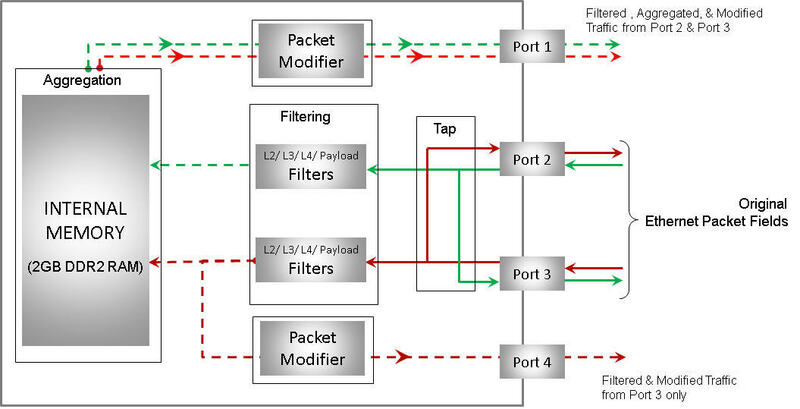 The schematic below summarizes the different functions such as tap, filter, packet modification, and aggregation of PacketExpert™ (up to 1000 Mbps) PacketBroker application. Tap: Traffic is forwarded between the Pass-through ports (Port 2 and Port 3) without any modification or delay. This makes the Ethernet link connected between Ports 2 and 3 act as a transparent full duplex Ethernet link, so that the connected devices/networks will not notice that a device is connected between them. Filter: It supports wirespeed filtering of Layer 2/ Layer 3/ Layer 4 Ethernet packets, with each port featuring up to 16 simultaneous filters each of 40 bytes in length. Mono Trigger and Continuous filter modes are also supported. Filter can be set to any offset within the packet, which gives flexibility to filter any header field as well as the payload. 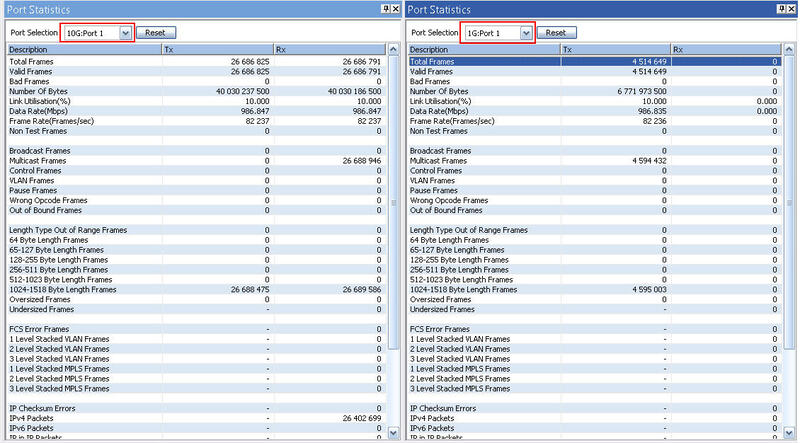 Aggregation: The Port2 (pass-through port) traffic filtered is normally sent out on Port1 (output port). Similarly, Port3 traffic filtered is sent out on Port4. Alternatively, the filtered traffic from both Port 2 and Port 3 can be aggregated and sent out on a single port as a single stream. Since the aggregated stream rate can exceed wirespeed rate of a single port, the aggregated traffic is buffered in the onboard 2 GB DDR2 RAM memory, before being sent out. The PacketExpert™ hardware modifies the received packets and replaces the Source and Destination MAC Addresses (of 12 bytes) fields with Timestamp (8 bytes), Filter No. (2 bytes), Board Serial No. (1 byte), and Port No (4 bits) fields. 4 bits at the end are unused and is set to Zero. The new CRC (4 bytes) is calculated for the modified fields and is appended. 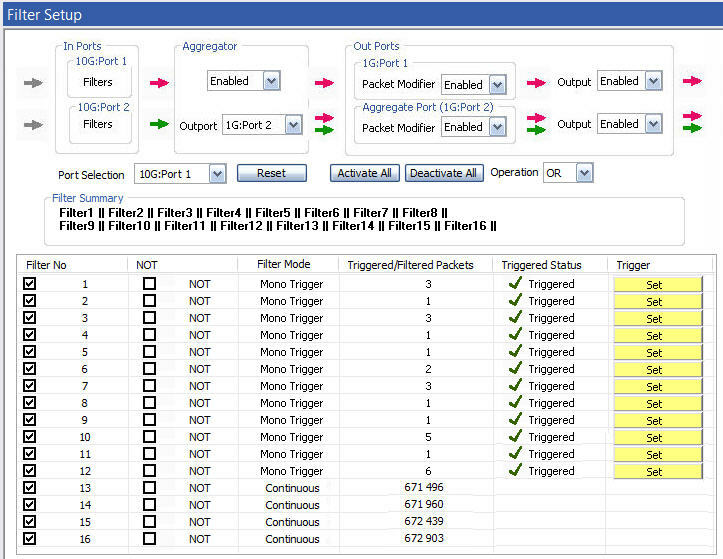 Wirespeed filter within PacketBroker supports Raw Mode and Packet Mode filter configurations. Filter can be set to each bit in the packet (Raw mode) or each field (Packet Mode). In Raw mode, each bit can be set to "Filtered" or "Don't care" condition via filter mask. Each filter has 2 sets (Value and Mask) each of 120 bytes length. Value contains the actual filter data used for comparing. Mask is used to indicate the bit/bytes to be compared or ignored. Various packet field values can be edited directly as per the layer stack (L2/L3/L4) selected. For each filter, offset can be set to any byte within the packet (from 0 to 15999 ) which gives flexibility to filter any field within any protocol header, or even the payload. Up to 16 simultaneous filters can be applied per port with “AND” /”OR” condition set to combine all the filters. Further, each filter can be set to either Accept or Reject the packet. MAC Layer Filtering – for MAC layer, Hex fields like Source and Destination MAC Addresses, and Len/Type layer parameters can be edited individually with the value and mask. VLAN layer Filtering - For VLAN Layer, VLAN Id field can be filtered by specifying the fixed value, or providing the range, or setting it to ANY. MPLS Layer Filtering - for MPLS layer, the MPLS stack parameter (MPLS Label) can be filtered by specifying the fixed value, or providing the range, or setting it to ANY. IP Layer Filtering - for IP layer, the IP layer Source and Destination Address parameters can be filtered by specifying the fixed value, or providing the range, or setting it to ANY. UDP Layer Filtering – for UDP layer, Source and Destination ports can be filtered by specifying the fixed value, or providing the range, or setting it to ANY. Each filter can be configured to run in either mono trigger or continuous filter mode. Continuous mode is the normal filter operation mode where packets are set to filter continuously. In Mono Trigger filter mode, once the packet that matches the filter is filtered, filtering is stopped and, any further packets are not accepted, even if they match the filter. The first single matching packet is said to have “triggered” the filter. User can set the trigger again manually at run time. Correspondingly, Triggered/Filtered Packets statistics are logged. 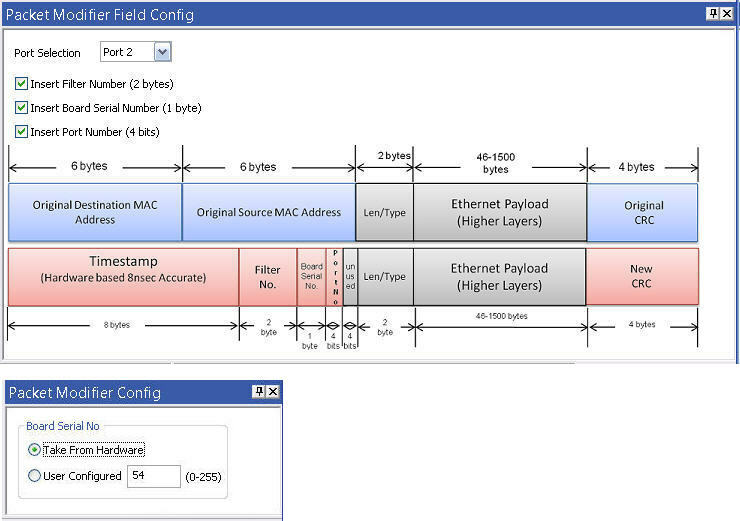 Wirespeed filter within PacketBroker supports Raw Mode or Packet Mode filter configurations. Filter can be set to each bit in the packet (Raw mode) or each field (Packet Mode). In Raw mode, each bit can be set to "Filtered" or "Don't care" condition via filter mask. Each filter has 2 sets (Value and Mask) each of 40 bytes length. Value contains the actual filter data used for comparing. Mask is used to indicate the bit/bytes to be compared or ignored. Various packet field values can be edited directly as per the layer stack (L2/L3/L4) selected. For each filter, offset can be set to any byte within the packet (from 0 to 2047) which gives flexibility to filter any field within any protocol header, or even the payload. The PacketExpert™ hardware modifies the received Original Ethernet packets at pass-through ports and replaces the Source and Destination MAC Addresses (of 12 bytes) fields with Timestamp (8 bytes), Filter No (2 bytes), Board Serial No. (1 byte), and Port No (4 bits) fields as shown in the figure. The new CRC (4 bytes) is calculated for the modified fields and is appended. The Hardware modified packets are then sent on Output ports. The 1 byte “Board Serial Number” field can be configured to either take the Board serial number automatically from the connected PacketExpert™ unit or user can manually configure own numbering. This helps in identifying which PacketExpert™ board captured the packet, useful especially when multi devices are connected. Detailed Tx Rx frame statistics per port are provided. 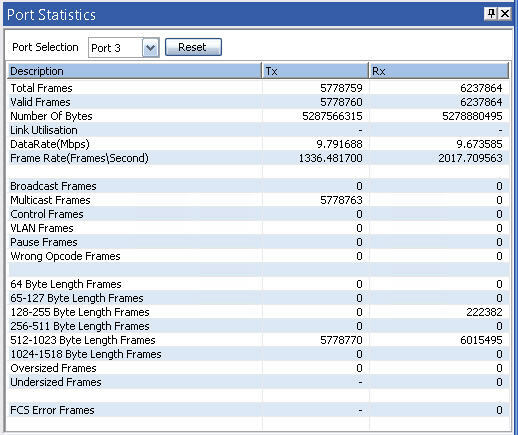 In addition to statistics like Frame Count, Frame Rate, Link Utilization, other statistics like Frame Type (Unicast/Broadcast/Multicast, VLAN), frame lengths (64, 65-127, 1024-1518, Oversized, Undersized), and FCS Error Frames are also provided. The following figure displays Tx and Rx port-wise statistics for 1G: Port3.